The benefits to humans of omega 3 fatty acids in fish oils are well documented, but a new study has found that fish oils can have a wider benefit to the environment — by reducing the amount of methane produced by cows. The report produced by University College Dublin found that by including two percent fish oil in the diet of cattle they achieved a reduction in the amount of methane released by the animals. 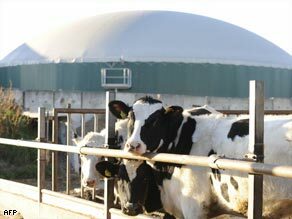 Lowering methane emissions is important for the environment, as the gas given off by farm animals is a major contributor to greenhouse gas levels. More than a third of all methane emissions, around 900 billion tonnes every year, are produced by methanogen bacteria that live in the digestive systems of cattle, sheep and goats. By volume, methane is 20 times more powerful at trapping solar energy than carbon dioxide making it a potent greenhouse gas. “The fish oil affects the methane-producing bacteria in the rumen part of the cow’s gut, leading to reduced emissions,” said Dr Lorraine Lillis, one of the researchers, speaking at the Society for General Microbiology meeting in Harrogate, England. “Understanding which microbial species are particularly influenced by changes in diet and relating them to methane production could bring about a more targeted approach to reducing methane emissions in animals.” Approximately 50 percent of Irish agricultural methane emissions result from farm animals, which has led to suggestions that, to help combat global warming, the numbers of cattle, sheep and goats should be capped. The researchers believe that it may not be necessary to limit the number of farm animals if their methane levels are reduced through diet.